47/365(+1), a photo by Luca Rossini on Flickr. Until now we’re having a great spring in Rome. Weather is nice, with warm temperature all day long, from dawn to dusk. So, when I finally get to leave my office, the last thing in the world I’d like to do is to go bury myself at home. 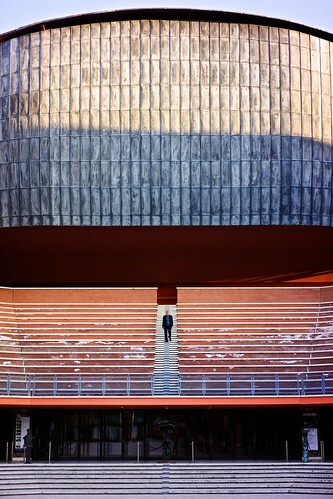 What I like to do, instead, is to have a walk with my family in our neighborhood, which usually translates into having a walk around the Auditorium Parco della Musica of Rome. I’ve already posted a shot from this place few days ago and, well, you now know why you should expect me to post more in the next days. The reason why I love wondering around this magnificent place as much as I can is that very soon we’re going to move quite far from this area, so I won’t probably come back here often, if not at all. And I’m sorry about that. I went to high school in this neighborhood when it still was considered a slum, I then moved in here with the girl I would have married a few years later, when the Auditorium was starting to transform it, and here is where we came back when we moved from being two into being three, just to find this place to be deeply transformed. The Auditorium has played a big role not only in the life of the neighborhood, but in the life of each person living here as well. So, nice weather, some good shots, an aperitif afterwards, Agata playing with the dog. And life tastes better. It actually tastes pretty good. And you know what, these are pretty simple things to love in life, things I can be sure to find in our next neighborhood as well. And, future tastes good as well. luca, is it true that the social contrasts in rome are more fatal than in other european metropolises? I'm not really sure about that, what do you mean with “fatal”? Deadly? Or just harder? hey luca, i mean greater or larger. my grandma is going to visit rome for the second time this summer. she had been there for a week last year – her first flights since more than 20 years! she was charmed by your city in that great measure that she will board a plane this summer again. this is the first side of the coin. the other side shows reportedly a huge indebtedness of the city government and big social differences within the citizens. can u confirm this statements?